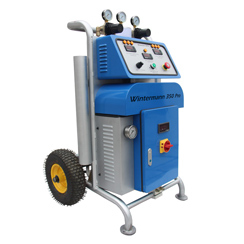 Wintermann 350 Pro can be used anywhere where there is not enough power to supply large equipment. With the optional power switch, the device can be powered from a three-phase or single-phase grid. small and medium companies. It does not require an expensive air dryer or a power generator. Although it is compact, the machine successfully sprays the majority of commercially available closed and open-cell foams. Manufacturers of foams distributed by us have carried out successful open-cell foam spray tests at a temperature close to 0°C. The heat output and design of the device are set so as to enable spraying polyurethane also in harsh environment. TBH Polska Sp. z o.o. is the exclusive distributor and service provider for Wintermann trade mark in Europe. In accordance with our company policy, we provide you with a free of charge training in the use of spraying and pouring equipment at our office and a whole range of warranty and post-warranty benefits. Our company is a manufacturer of various CNC and spraying machines. The Wintermann Raptor III Gun, recirculation and parking systems and other components are also designed and manufactured by us. We can design and manufacture equipment for special use or operating according to customers design. We provide the opportunity to lease or buy equipment on credit as we cooperate with many renowned leasing companies. - Air supply: 5 to 9 bar (0,9 MPa) ~ 1 m3 / min.